Every once in a while I’ll give a talk, or have a conversation with someone, or read an email and I’ll hear a question that goes something like this: Do you ever get tired of making pies? I like that question. It’s a good question. And it raises an interesting point: If you love what you do, is it normal/okay to grow weary of it from time to time? Does your pastor ever wish he could wake up on Sunday morning and say heck with my flock; I’m gonna pour me a margarita and listen to some Jimmy Buffett. Does the President sometimes wish he could drive his own car and get a burger down at the corner greasy spoon without being noticed? Well, I can’t speak for any of them. But I can tell you that when my pie making spirit starts to wane I resort to an old trick that quickly takes off the pressure to be Super Pie Guy and restores my pie mojo: I make a skillet pie. 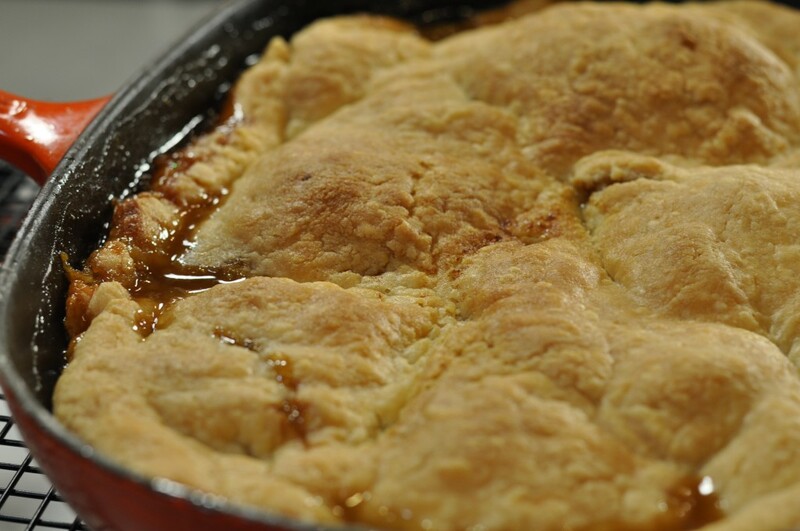 A skillet pie is way more than a reference to the vessel the pie is baked in. It’s a method and an attitude that tells the world you’re about to break all the rules and that they – warning: geezer language ahead – can either like it or lump it. Translation: forget about the bottom crust and peeling your fruit; never mind the thickener, either; ditch the perfectly uniform slices; and don’t worry about making a pretty sculpted edge. 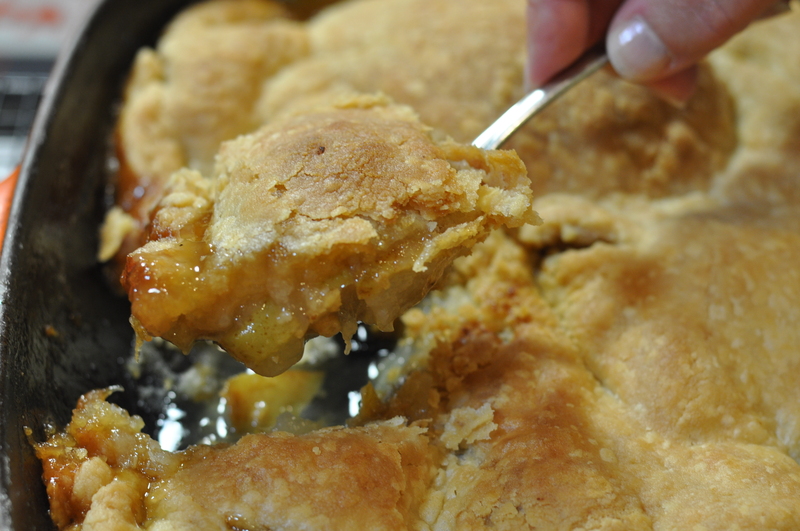 In short, thumb your nose at nearly every conceivable pie making convention, and do it with a smile. Will your my pie making reputation plummet now that you’ve embraced pie anarchy? On the contrary, it will SOAR once you’ve become the bad boy/bad girl of pie. Your devil-may-care, take it or leave it approach will attract admirers like bees to honey. Your kids, who typically believe you’re about as interesting as a potted plant, will think you’re awesome and start bringing their friends around. Neighbors will whisper, but secretly envy you. You’ll notice a little extra spring in your step. I’d say it’s worth a shot, wouldn’t you? Here’s one recipe to get you started, you wild thing, you. PASTRY NOTE: Proving its versatility once more, I recommend my ever-faithful GOOD BASIC PIE DOUGH for the top crust here. If you haven't already, prepare the pastry and refrigerate. Get out a large, cast-iron or other oven-going skillet and set it on your stove. Preheat the oven to 400°. Start heating your skillet, adding the butter, maple syrup, and sugar before it gets too hot. Bring the mixture to a boil, then reduce the heat slightly but continue to boil, stirring, for 1 minute. Remove from the heat. 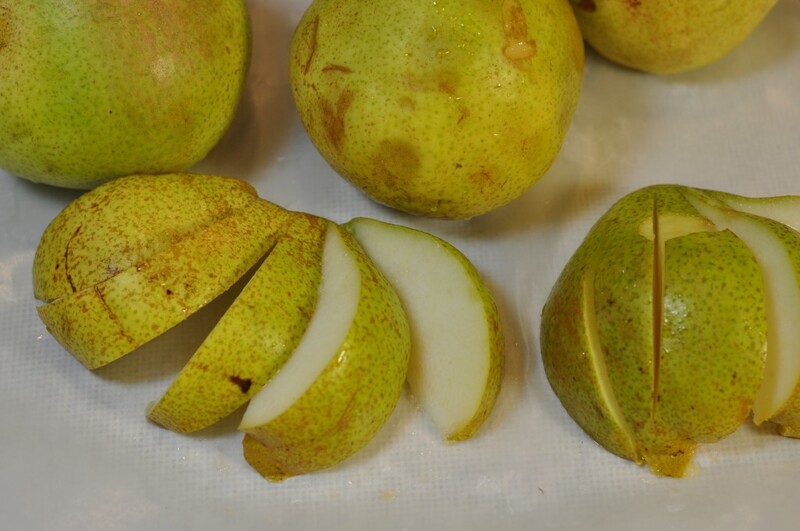 Working with one piece at a time, place a pear quarter on your cutting board and slice it, sort of on the diagonal, into 3 or 4 sections, leaving part of the stem end intact. (See photo above; those are halves but it actually works better with quarters.) Leaving the end intact will help you fan the sections out, but don't worry if they happen to break apart. Remember, this is a low stress, high yield pie. Arrange the fanned sections in the pan randomly, skin side up. Where there are gaps, just fill them in with individual slices. You should end up with one compact layer. 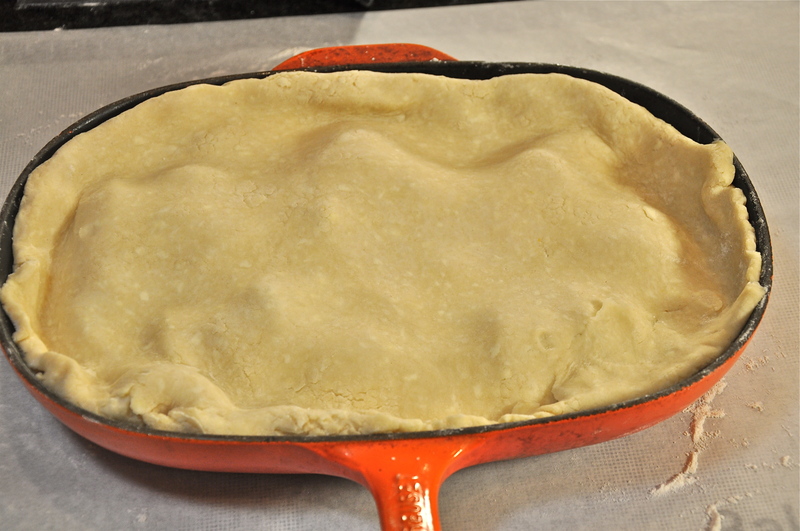 Using a sheet of lightly floured wax paper, roll your pastry slightly larger than your pan's diameter. 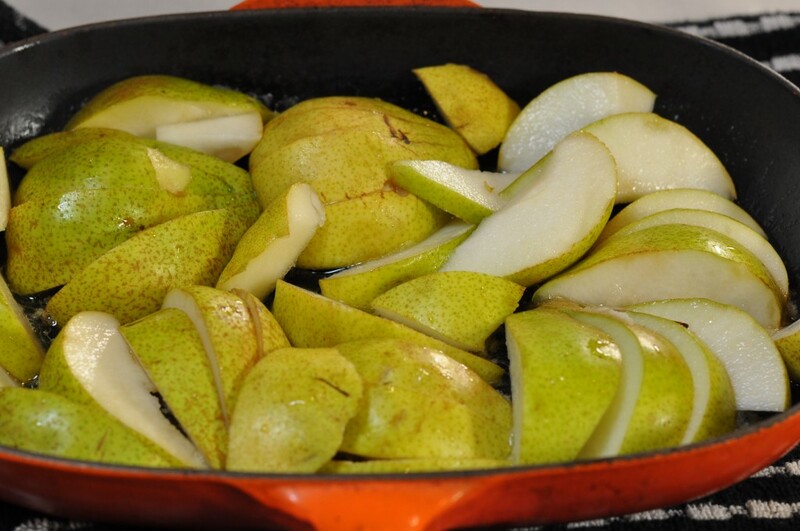 Drape the pastry over the fruit, tucking the edges down between the fruit and the sides of the pan. Make one or two steam vents in the top crust with a paring knife. Bake on the center oven rack for 25 minutes. Reduce the temperature to 375° and bake another 20 minutes, until golden and bubbly. Transfer to a rack. Cool the pie at least 10 minutes before serving. Don't try to slice it; just spoon it out. Without the thickening, they'll be a fair amount of juice in the bottom of the pan, so scoop some up with each serving. Excellent alone or with ice cream. Makes 8 servings.